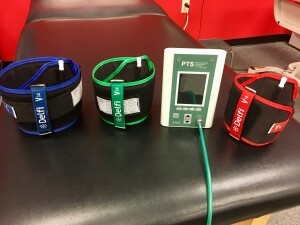 Blood flow restriction (BFR) therapy/training is one of the newer and more exciting techniques being used in the sports medicine field. I received training with Owens Recovery Science and have been utilizing personalized blood flow restriction (PBFR) therapy in my clinic since November 2017 using the Delfi personalized tourniquet system (PTS). In addition to hypertrophy, there also appears to be an application for preventing disuse atrophy simply using occlusion. 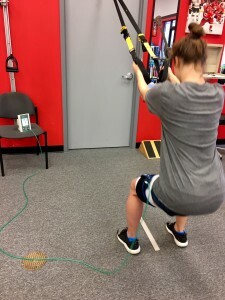 This may prove very beneficial for clients who are non-weightbearing after an injury or surgery, yet not able to perform much resistance training. It should noted that there are several type of BFR training aids on the market. Since I am in the clinical setting day to day, I wanted to use a system that accurately and consistently measures the amount of occlusion in my clients. This is why we partnered with Owens Recovey Science and use the PTS and wider tourniquets. A 14 y/o soccer player w/BTB autograft ACLR performed on 6-13-17 develops patella tendinitis at 14 weeks post-op. I used a Cho-pat strap, ultrasound, iontophoresis, IASTM, stretching, eccentrics, activity modification and laser used from 9/11 – 12/4 to reduce pain w/o success (23 visits). Therefore, I shifted the treatment focus from 12/4/17 to 1/4/18 to strength only with BFR focused therapy with resolution of palpation tenderness and ability to run and jump pain free in in just 8 visits. That result speaks volumes to me and the patient. I am currently in the process of testing and adapting exercise protocols with different diagnoses, but I am very encouraged with the early returns. I feel this adjunct to PT will be an excellent tool for accelerating strength recovery after surgery, reducing disuse atrophy and allowing people who could not previously load their joints with traditional strength training an opportunity to increase strength with lower loads thereby sparing their joints from higher loads. The following list includes some general contraindications, but ultimately your physician or healthcare provider can determine if you are a good candidate or not. Is the sickle cell trait a contraindication or yellow flag? According to Owens Recovery Science it is a relative contraindication, but I would defer to one’s personal MD prior to moving feared with it to be on the safe side. Just curious as to how occlusion of the upper arms impacts RTC strengthening? I’ve seen videos of people during RTC work with it on their arms but the mechanism doesn’t quite make sense to me. By occluding blood flow to the arm, the perceived load to the muscle is much higher compared to the low load. In rehab, we often cannot load muscle enough (75-80% 1 RM) to elicit true hypertrophy due to pain, precautions, inability of the joint to accept load, etc. We clearly need more research, but this is a promising tool to be sure. I have seen very positive clinical responses to date.